Kenny Thomas, was one of the highest profile recruits to ever have attended the University of New Mexico where he still has a presence in the record books for many of his accomplishments. A proud Lobo and Hall of Fame Inductee, Kenny still holds UNM records for freshman scoring, rebounding, personal fouls and more. In addition, he was selected as one of only 5 players to achieve the status of “All-American” in 1998. Kenny is still hailed as the only Lobo to achieve All-Western Conference athletic conference 3 times. Kenny Thomas, was drafted first round in the NBA by the Houston Rockets, in 1999 and enjoyed a remarkable career playing for 3 franchises before his retirement in 2010. He has since launched the Kenny Thomas Foundation which focuses on empowering youth, Infinity02 a first of its kind health and wellness product, commercial real estate entities, and several other start-ups. 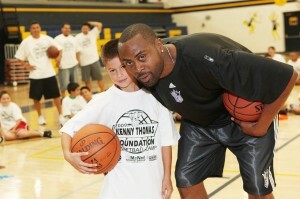 After a successful career in the NBA, Kenny knew he wanted to teach kids the game he fell in love with — basketball. He is passionate about teaching today’s youth essential life skills by learning to play basketball, a game in which teamwork is at the forefront, and great leadership is learned. His dream is to grow the camp every year so children have a chance to play basketball, and learn valuable life skills from the game. Though Thomas’ professional career has been full of accomplishments, the one he is most proud of is fatherhood. Kenny boasts, that being a Father to his two children Matthew (15) and Jeremiah (7) is most important to him, and the driver for his continued success. We are honored to have Kenny as a guest at our Breakfast Egg-Stravaganza this year!